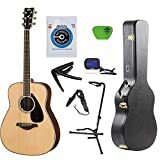 Yamaha FG700S Guitar Review 2019 – is the Yamaha FG700S acoustic guitar worth the money? Review of features, pricing, design, sound and more. Well, right off the bat, we may start by saying that Yamaha FG700S is an incredibly good guitar for its price. Yes, we realize that this perhaps sounds more like a sales pitch and less like a review. But, just to drive the point home, this guitar is really that good! This dreadnought comes with a rich, loud volume, has that real oomph if you like, and at the same time, is able to retain great clarity of tone even at such a high volume. Again, something not too common for an acoustic in the $300 price bracket. However, to anybody with some familiarity with guitars and with different models, none of the above would come off as hyperbole. Yamaha introduced its FG series of acoustics way back in the 60s and the models from this series have found favor with generations of guitar players. You can still hear someone decades older than you waxing nostalgic about how he cut his teeth with a Yamaha FG and although he has moved on since, that old model still retains its prize of place in a closet or in a corner of his guitar room, perhaps. Well, all of this is to give you an idea of the cherished tradition of Yamaha FG. Now, to come to the dry facts, or the specs if you will. Arguably, the most important aspect when it comes to the material and construction of this guitar is that the FG700S features a solid Sitka spruce top as compared to laminated tops that you will find in most under-$500 acoustic guitars and this includes most other models in the FG series as well. The spruce top comes in a fine grain, natural finish (coated only with a thin hand-sprayed lacquer about 0.25 mm thick). The wide dynamic range (more on this later) that this guitar is able to provide is largely due to that sitka spruce top. Bracing: Yamaha uses non-scalloped X bracing for all models on the FG series. To go by their own blurb, this helps the guitars retain their response, tone consistency, and stability for a lifetime. That this isapparently a fact is borne out by the extremely log durability of the FG models, again something not usual with lower-end guitar models. The Back and the Sides: These are made of laminated Nato Mahogany wood. As we’ll find later that Eastwood Mahogany is a better option for dreadnoughts and some FG models somewhat higher up the range use Eastwood for back and sides. However, some also say that spruce and mahogany is a great combination for acoustic guitars and nato, although not as highly favored as the eastwood mahogany, is a mahogany all the same. Which means that you do not lose much by the way of sound and tone just because it is made of nato wood. And, of course, you cannot practically expect solid wood back for a guitar at this price bracket! Action and Nut Width: The action in this guitar is pretty average and most people won’t find it an issue, even when playing barre chords or doing bends or slides. However, if you do feel the action is a bit too high for you, you can always adjust it to your liking. The truss rod is 4mm and if you can alter the action yourself, just take it to your nearest guitar store and it can be done in no time flat. The nut width at 43 mm is again fairly average and you should be pretty comfortable with it. One downside, however, is that the both the nut and the saddle are made of plastic. Of course, this is nothing shocking for a model priced at around $300. You will find many models in the $500-$1,000 category still use cheap plastic rather than bone saddle and nut. This again is no big concern since you can easily replace both the nut and the saddle with bone varieties for a paltry investment. That is pretty much about the body and the construction of the guitar. If you want to know more, the standard 3-a-side headstock is fitted with quality diecast chrome tuners that help with fine tuning and the tuning won’t easily go off even after some heavy strumming, bending, etc. The model has a 20-fret fingerboard made of rosewood with small round fret inlays. However, since it is not a cutaway model, the upper fret would be harder to access though you can still slide up to them without much difficulty. Appearance: Finally, there is the roseate/chocolaty pickguard that you may or may not like, according to your taste. If you ask us though, we are fine with it and actually, like it. On a last note about the appearance of the guitar, many tend to complain that it isn’t visually appealing or looks too simple, etc. We do agree that the model is not too ‘visually attractive’, but ask yourself: what is more important to you—the visuals or the sound, tone, durability and in short, the overall quality of the product? If you go for the latter, this guitar is for you! This is a dreadnought, and as is expected from a dreadnought, it comes with a full, rich sound with a high volume. What impresses us most though is that even in such a high volume, the model provides incredible clarity of tone. As for the tone, it is more on the bright and the crisp side although it also depends, for the good part, on how you are playing it. This is what we were talking about when we mentioned above the wide dynamic range of this guitar. The model lends itself to many different styles- rock, pop, blues, bluegrass and so on (though, ironically enough, not so much to “folk” perhaps, in our estimate anyway—ironical since Yamaha advertises the FG series as ‘folk acoustic guitar’). Yamaha acoustics are available in a considerably wide spectrum of price and as such, there is little profit in comparing this model with higher end, above $1,000 category models. However, if you are willing to spend a bit extra, you may consider the Yamaha FG730S (available at about $100 more). With its rosewood back and sides, you get a fuller and an overall more beautiful sound with the FG730s models. They are also available in two different color finishes (if that is important for you). Another good alternative is Yamaha FG 720S (costlier than the FG700s by about $80). This last one boasts of two distinct advantages compared to its 700s colleague: (1) it comes in a variety of different color finishes and (2) the back and sides are made of Eastwood mahogany which is a superior quality wood than Nato. On the flipside, however, with none of the above models you get a solid spurce top that you get with an Fg700s. Based upon feedback submitted by over 250 customers the Yamaha FG700S Guitar has received an average 4.6 out of 5 star rating. We discuss why in this review article.